Let us help you complete the look of your event with our products for your tables. Use our fitted tablecloth for a quick and easy way to cover your entire table. 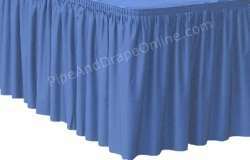 For a more formal look, our table skirting is available in sizes to fit nearly any standard table. 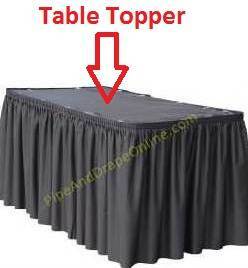 Our table toppers cover the top portion of your table when used with table skirting for a finished look. 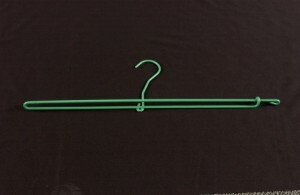 We carry durable metal table skirt hangers for convenient storage of your table skirting. If you need table skirting clips, we have skirt clips that fit most table thicknesses. 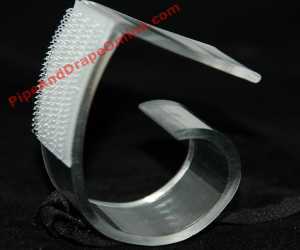 Our website has our two most popular sellers available, but we also have other clip sizes available upon request.